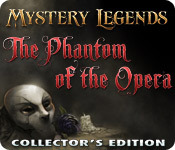 Mystery Legends: The Phantom of the Opera is a gothic fantasy / horror hidden object game that uses the key characters and events in the novel The Phantom of the Opera (but better known through the Andrew Lloyd Webber musical adaptation) and presents a new story set long after the events of the novel. The game's many fantasy art scenes depict the key characters and the many areas in the burnt down opera house. This fantasy art / game art gallery for Mystery Legends: The Phantom of the Opera has a slideshow with all the beautifully illustrated characters.